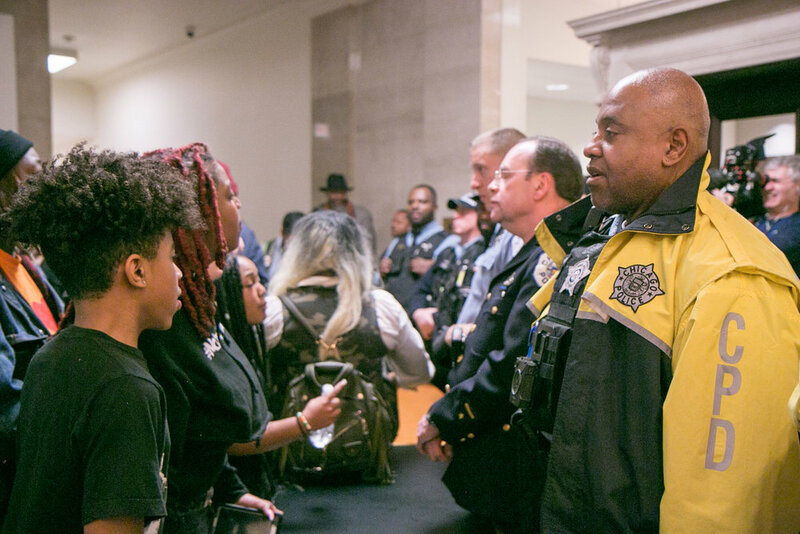 On Wednesday, hundreds of young activists were denied entry to Chicago City Council chambers during the vote on the controversial police and fire training academy. Hundreds of young activists were denied entry to City Council chambers during the public meeting. The night before City Council convened, youth activists held a sit-in at City Hall. While waiting outside of City Council chambers, the group of primarily Black and Brown youth-led demonstrators chanted, stomped and danced loud enough to be heard inside the council meeting. During the initial public comments session, which occurred before the vote, youth activists Destiny Bell and Destiny Harris spoke out against the academy. Ald. Mitts (37th), whose ward will house the academy, has been a staunch supporter of the initiative. After watching Emanuel talk with staff and look at his phone during previous comments, Bell demanded Emanuel look at her while she spoke. “The fact that you can’t look me in my face while I’m talking shows how much of a coward you are,” she said. Harris, who spoke at Bernie Sanders’ rally at Navy Pier on March 3, told City Council that 300 people came in support of the #NoCopAcademy movement but were refused entry into the chamber. She was silent for a moment to allow the chorus of chants from the hallway to be heard. When activists crossed a police control rope paired with a metal detector, police placed tables between themselves and the crowd to create a barrier. The tables pushed against the bodies of the youth at the front of the group. One demonstrator sat on the table, placing herself as close to the chamber as possible without crossing the makeshift border. After the vote, Bell and another activist inside council chambers took an elevator down to the first floor where they joined a smaller group of people chanting in the lobby of City Hall. Soon, the rest of the activists moved to the first floor of City Hall, where they chanted in a circle accompanied by drumming. Then, the group took their march to the streets.